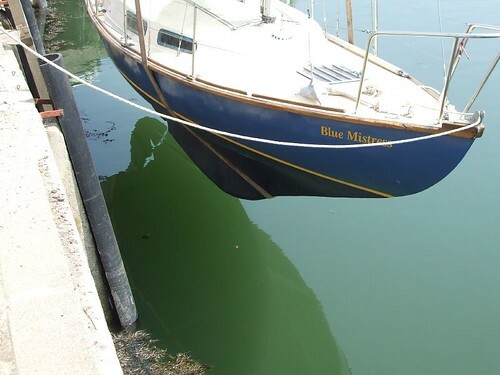 Blue Mistress is in her winter berth following a short voyage – (short story to come later), and the honeymoon is over. Bought in May, put on the water in July, this is the boat I have always wanted. The excitement has been in discovering the pluses I knew would be there. Speed wasn’t the issue. I wanted her to sail well in a sea, to hold a course, to sail consistently under a reefed mainsail, to be easy to sail myself and so enjoy different crews of different experience, although she would be too small to live aboard, to have sufficient accommodation to spend several days cruising along the coast. Many family and friends, (but not all yet), have spent time on board. We have been to Fowey (in a blow) and back, and I have been out to the Eddystone solo, (no Katie Miller but good enough for me). In the past three months, we have hoisted every sail in most conditions (no full gales), and motored in flat calm across a breathless sea. I have revised old navigation skills, looked to my seamanship, obtained a Short Range Certificate and have come to realise that I have seriously underestimated the advance of technology in sailing. I have picked up a mooring solo in a fast spring tide, (as well as failing to do so and having to come round again). And I have found myself wanting in many areas. 1. The details that don’t live up to expectations – Why does the depth sounder consistently fail to register depth? Why is the starboard lower shroud anchored with a different bottle screw to the other shrouds? Where is the leak in the deck coming from? (if it’s not sea, it’s rain I worry about!) The spray hood needs repairing. And the main sheet track needs rethinking.There’s a long list. 2. And I didn’t buy a boat to spend time sailing aimlessly, however good that can sometimes be. There are modifications to the accommodation that would be allow me to write on board and practice my photography – perhaps more chart space. And a sturdier engine box/step to the main hatch. And a whole range of technology to research. 3. 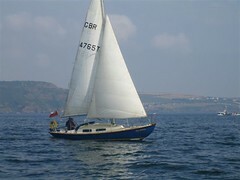 And as much as I enjoy sailing in Plymouth, would we be better based further east along the coast, nearer home? Just a thought. We will be in the water for most of the winter and there’s more sailing to come. So Phase Two looks to be full of interest, ups and downs, and a lot of fun. Whatever the future holds, for sheer rush, it will be hard to beat that moment when Blue Mistress’ keel first touched the water. what is the age of the boat?